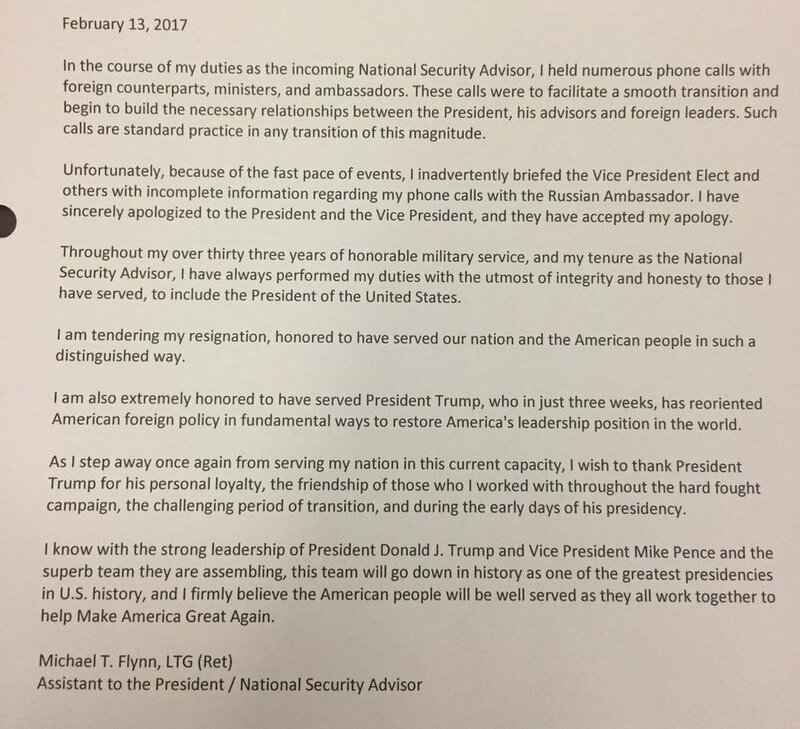 Michael Flynn has resigned as Donald Trump’s National Security Adviser. The resignation comes days after Flynn’s controversy about speaking to Russian officials came to light and, reports that he lied to Vice President Mike Pence about it. Mr. Flynn, who served in the job for less than a month, said he had given “incomplete information” to about a telephone call he had with the ambassador in late December about American sanctions against Russia, weeks before Mr. Trump’s inauguration. Mr. Flynn previously had denied that he had any substantive conversations with Ambassador Sergey I. Kislyak, and Mr. Pence repeated that claim in television as recently as earlier this month. But on Monday, a former administration official said the Justice Department last month warned the White House that Mr. Flynn had not been fully forthright about his conversations with the ambassador. As a result, the Justice Department feared that Mr. Flynn could be vulnerable to blackmail by Moscow. Retired General Keith Kellogg is standing in as acting national security adviser. While there are no announcements as to who will be the permanent replacement, Gen. David Petraeus will be going in on Tuesday to interview for the position and Gen. Kellogg is also in the running. Michael Flynn abruptly resigned as President Donald Trump’s national security adviser Monday night, hours after it was learned that the Justice Department informed the White House that it believed he could be subject to blackmail, two senior Trump administration sources told NBC News. Flynn’s status was considered perilous after it was disclosed that he had misled Vice President Mike Pence and other senior officials about his communications with Russia’s ambassador to the United States, a senior U.S. official told NBC News. American Military News reported earlier that the White House was evaluating the situation regarding Michael Flynn. “In the course of my duties as the incoming National Security Advisor, I held numerous phone calls with foreign counterparts, ministers, and ambassadors. These calls were to facilitate a smooth transition and begin to build the necessary relationships between the President, his advisors and foreign leaders. Such calls are standard practice in any transition of this magnitude.